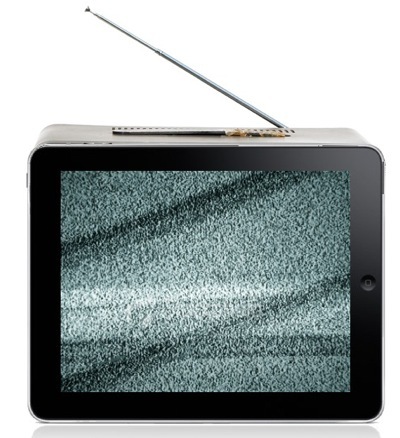 Apple’s iPad Disrupting the Network TV Business Model? I’d Buy That for a Dollar! The iTunes pricing debate is be getting hotter, as the iPad’s launch date approaches, with news that networks are wary of Apple’s lower price plans. The TV industry’s following the music and publishing biz here…will things be different this time? According to a piece in the The New York Times, the discussions between Apple and the TV networks, aiming to get more content into the iTunes media store in time for the extremely media-friendly iPad’s arrival, are stuck on one main point: price. Apple is rumored to be seeking lower prices, perhaps towards $1 per show (half what it costs now) in order to tempt people into buying more media through iTunes. But the TV industry is exhibiting broad “skepticism” to this plan, says the Times. Though they’re obviously keen to get aboard Apple’s iPad bandwagon–thanks to the predicted runaway success of the device–they’re clearly worried that lower prices will sap their revenue streams. An anonymous executive even said “We’re willing to try anything, but the key word is ‘try&apos;” when the Times quizzed him on the matter. Why is this such an issue for them? There are 125 million registered iTunes users, representing a gargantuan potential market, waiting to be tapped. The main worry is that TV production is expensive, that each show represents a huge investment in time and money, and the content owners are worried that they’ll be undervaluing their product by following Apple’s plans. This is incredibly short-sighted, for one reason alone: Piracy. It’s so simple, fast, and painless to download a TV show illegally, despite the extra bits of bother one has to go through to transfer the resulting files into iTunes so that the function exactly as if you’d bought them legally. The TV networks, by resisting Apple’s lower price push and withholding some TV shows from the service altogether, are simply pushing more folks toward pirating their content. How about that for undervaluing your product? If the prices were attractively low, you’d almost certainly tempt some of these people toward more legal downloading, and thus access whole new audience members who you’d not have attracted before. The upshot would potentially be more revenue, not less–even accounting for the slight dint this would put in DVD sales. But there’s another thing going on here. All of this posturing in public could easily be a part of the negotiations with Apple. They have to be extremely tense, we can guess, and it would be plausible that either of the parties leaked this issue to the Times. The TV networks have been dealing with Apple for several years, but haven’t fully embraced the iTunes ecosystem–and all this while they’ve watched Apple tackle and reinvent the business models for the record business, the cell phone carrier business, and most recently the publishing business. In each of these cases, by upending the existing model, Apple’s forced each industry to tackle the difficult question of exactly what their content is worth, in a digitally-connected era. The TV business, used to clawing in huge piles of money and sitting in the commanding role, is obviously scared stiff of the power Apple has to make it face this question too.